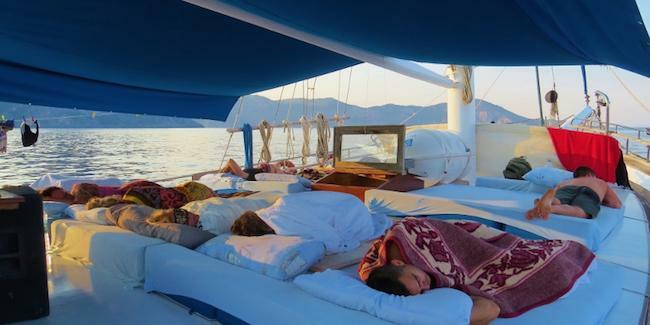 Join Volkan’s Adventures on this private and exclusive 24 hour Gulet Cruise. 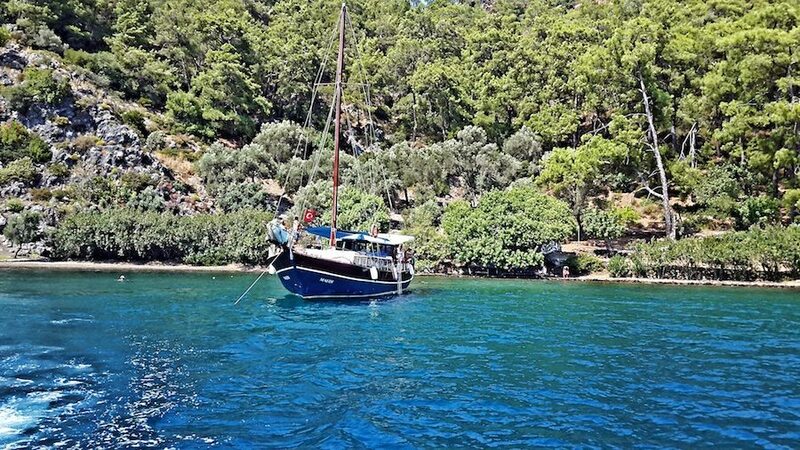 Sailing along Turkey’s spectacular Turquoise Coast on a traditional style wooden gulet is one of the very best ways to explore this stunning coastline. Much of this area is uninhabited. Discover secret beaches along the shoreline. Bays, coves and small islands all provide peaceful mooring spots, overlooked by majestic mountains and dark forests. Relaxing, swimming and snorkelling are the main activities on-board. 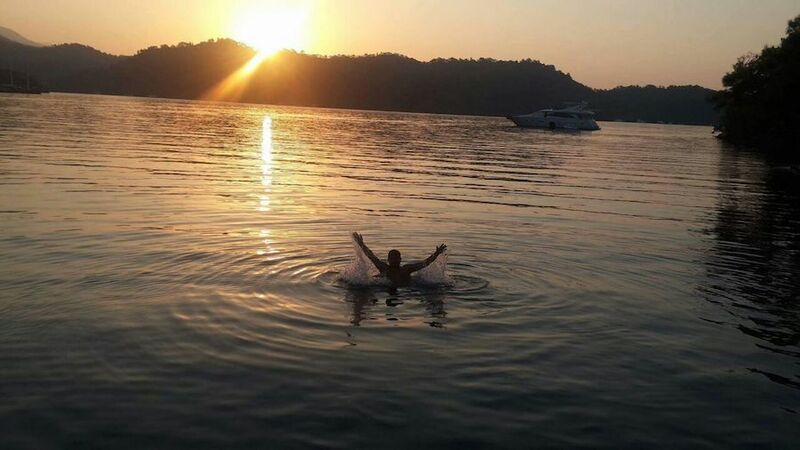 You can also try fishing at dusk, watching the sunrise and swimming in the first rays of sunshine. This will be the trip of a lifetime, having fun, playing games, dancing to music, learning history and geography, eating delicious food and enjoying the company of others. 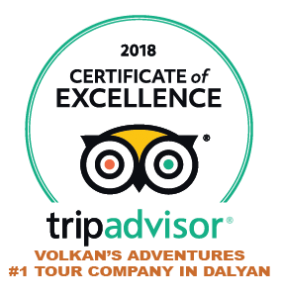 Your day begins with you being picked up from your Dalyan Hotel / Villa at 9.00am. 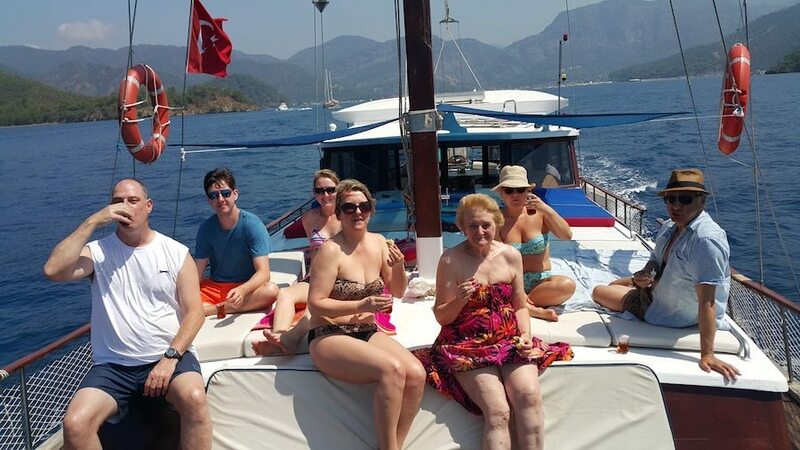 We will then enjoy a short drive to Gocek, where we will join our boat. A welcome drink of tea, coffee or fruit juice, along with snacks will be available as you board the boat. Unlimited tea, apple tea, coffee and water will be free of charge during the trip. Homemade snacks, fruit and nibbles will also be served. 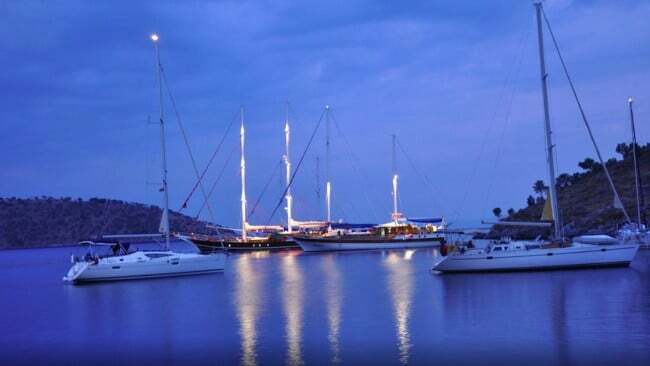 We will spend our Gulet Adventure discovering the furthest and most secluded bays. You will be able to swim in the deep, clear waters or relax on-board. 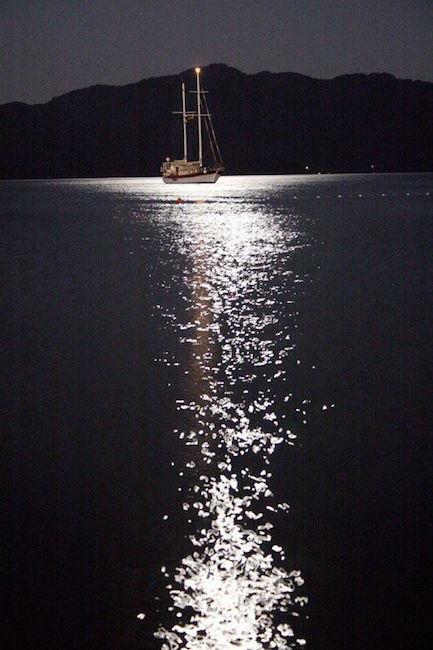 This will be followed by an equally magnificent night anchored in a closed bay. The stars in Turkey are beautiful, nothing beats lying back and picking out the constellations from the velvet black sky. 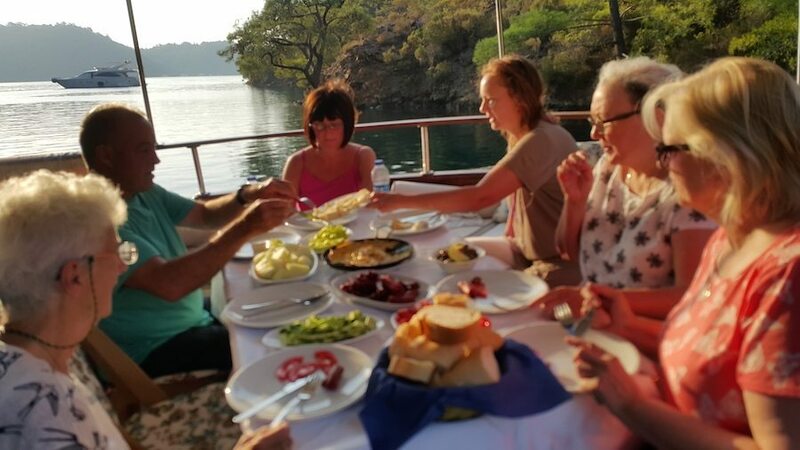 Another main feature of a gulet cruise is the food. Delicious fresh food being provided by the cook from a galley kitchen. Typical main meals are chicken, meatballs, fish and a vegetarian option with a local salad. 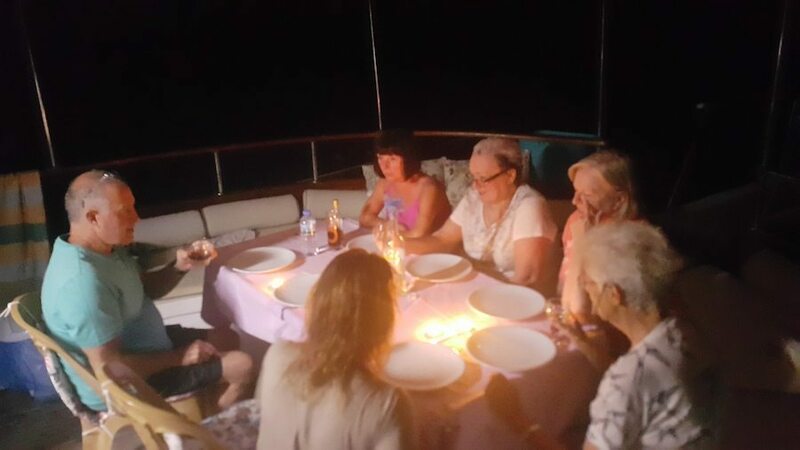 For evening dinner we will fire up the on board BBQ, and cook fish, Turkish kebabs, assorted meats and vegetarian options. Both meals will include pasta, rice and delicious mezes. The following morning we will serve a delicious Turkish breakfast with freshly cooked hot foods. The cost of the trip includes all meals. One of the most glorious parts of your cruise will be as you wake to a glorious sunrise. 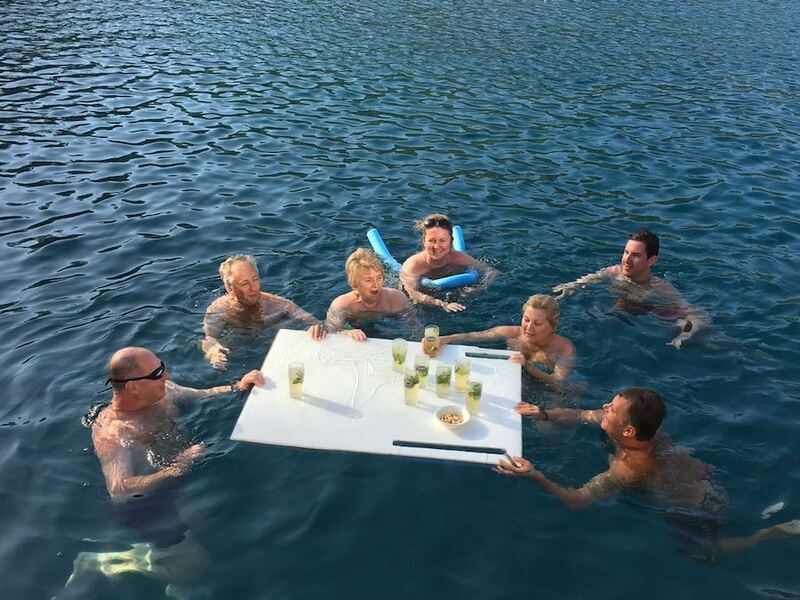 Why not take a refreshing dip in the warm waters whilst your breakfast is being prepared. After a delicious fresh breakfast with plenty of tea and coffee we will slowly make our way back to Gocek. This is a very special way to spend 24 hours. We can cater for all your desires, you just have to ask. It is the perfect way to celebrate an anniversary or birthday or merely to get away from everything with your nearest and dearest. 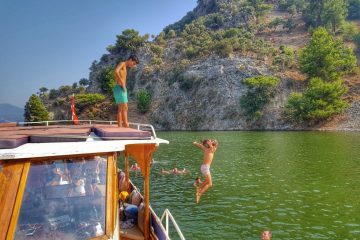 We will arrive back to Gocek Bay by 09.30 a.m., and return to Dalyan around 10.00am. 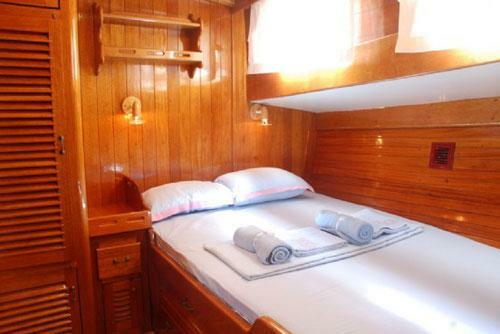 Max 4 guests – There are 2 cabins with showers and rooms to change. People can also sleep on the deck under the stars. With regards to additional alcoholic or non alcoholic beverages you are more than welcome to bring your own to consume on board the boat. We did this trip in September 2016, we found the communication through e-mails to arrange trip excellent and prompt. We were picked up on time from our villa and meet the lovely couple we were sharing trip with. We were a party of four women and we were asked if we would prefer a trip by ourselves, however we were happy to share this experience. We arrived on boat and eventually set sail. The cabins we basic but clean and most had there on toilet, we were left to decide which we preferred. Although all but our 85 year old mum slept on top deck. 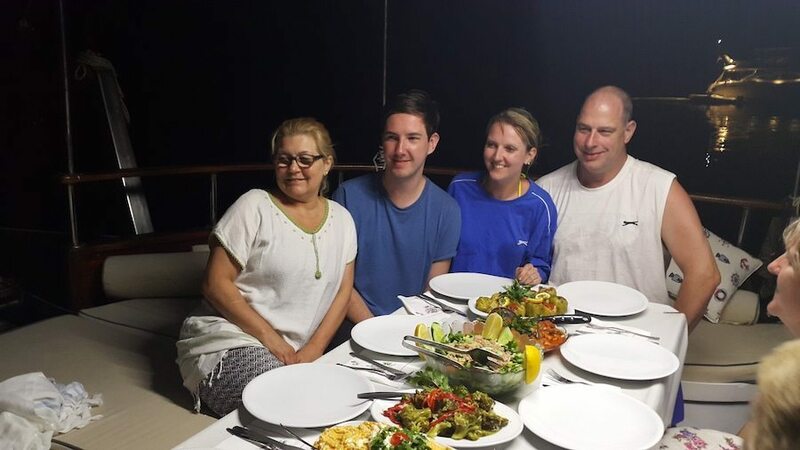 There were two crew members who did everything for us, including the cooking which was very good and plentiful. We swan,slept and generally had a most relaxing time. Volkan joined us for dinner and is a very informative person, we had some very interesting conversation. 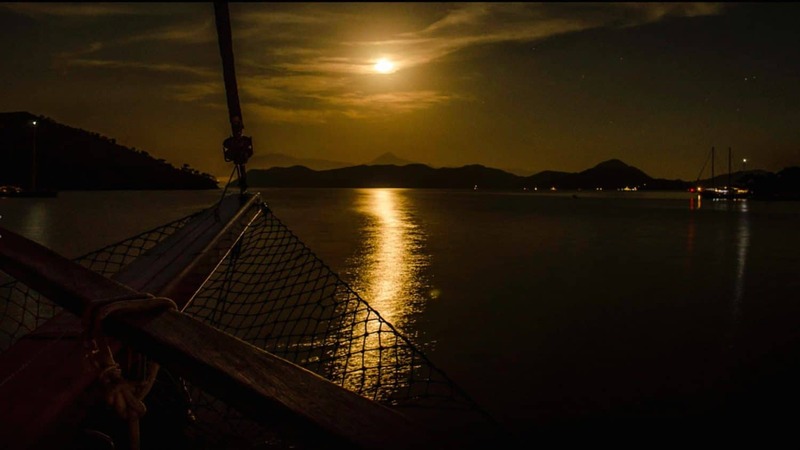 The best part for me was seeing-just before I fell asleep two shooting stars and waking up at three in the morning, totally disoriented then seeing a sky full of stars the gentle sound of waves and the slight rocking of boat as I fell asleep again. You cannot do this trip without feeling recharged afterwards. I do have a few gripes. 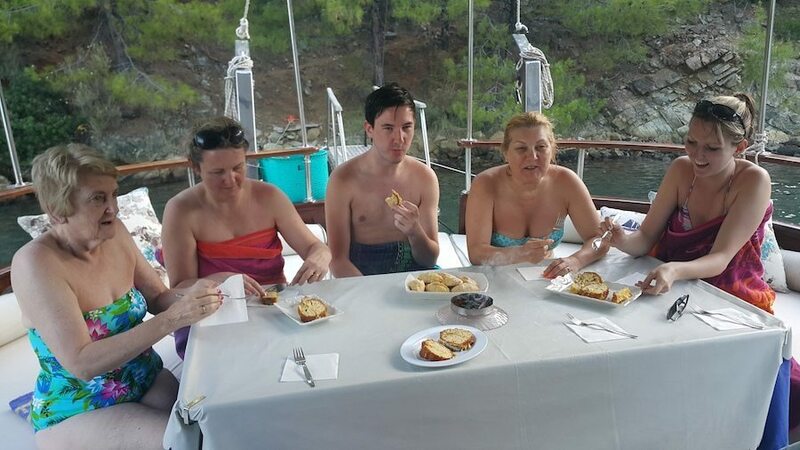 When we arrived on boat we were not offered anything to drink straight away, I do know the crew were busy getting ready to sail, but it was very hot and someone did eventually ask for water which was given straight away. We were given tea soon after this as well. Also as we have done a three day trip with another company we were attracted to this one as it advertises going beyond the twelve island’s. To be honest we don’t think we went to far out of the harbour. Also they say snacks will be available which we never saw, and it did say water would be free which we were charged for. Nothing major all these things and I am sure volkan will take these points and work on them for the future, I would have mentioned at the time but like I said I was to relaxed to bother.